Our corner hydrangea bed is in full bloom. This bed consists of three Endless Summer plants and three Nikko Blue plants (along the chimney and under window). This little guy is not a hydrangea at all, but he scampered by while I was taking pictures. 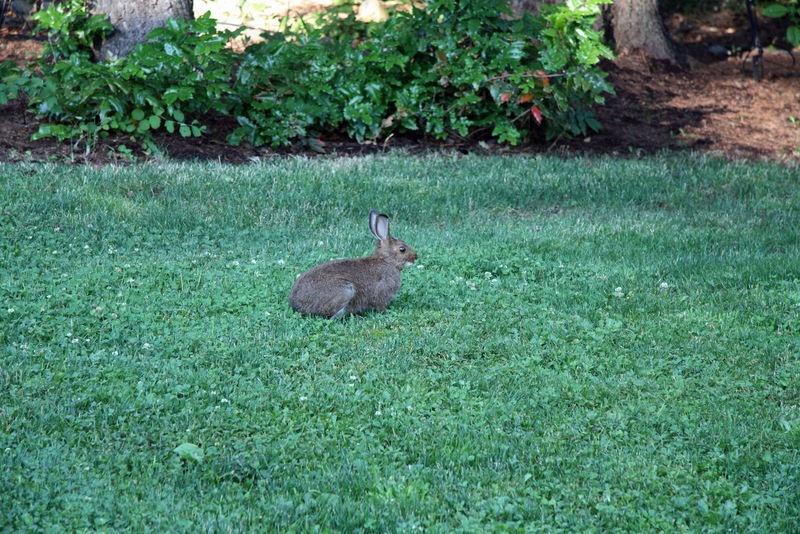 We call him Peter Rabbit although he is wild so we won't be dressing him up in a cute blue coat. The Endless Summer hydrangea are a mix of colors. Some are pink. Some are a light lavender. Some are a mix of blue and lavender. This collage shows the variety in the Endless Summer blossoms. They are in their third growing season (planted as one gallon pots). Here is another Endless Summer example. 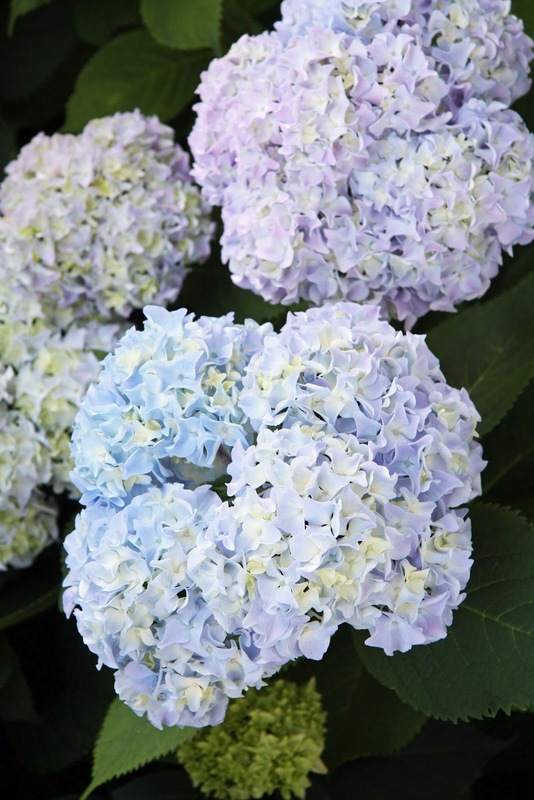 The Nikko Blue have a more consistent hue from blossom to blossom. Their view in the early morning light. What beautiful photos! 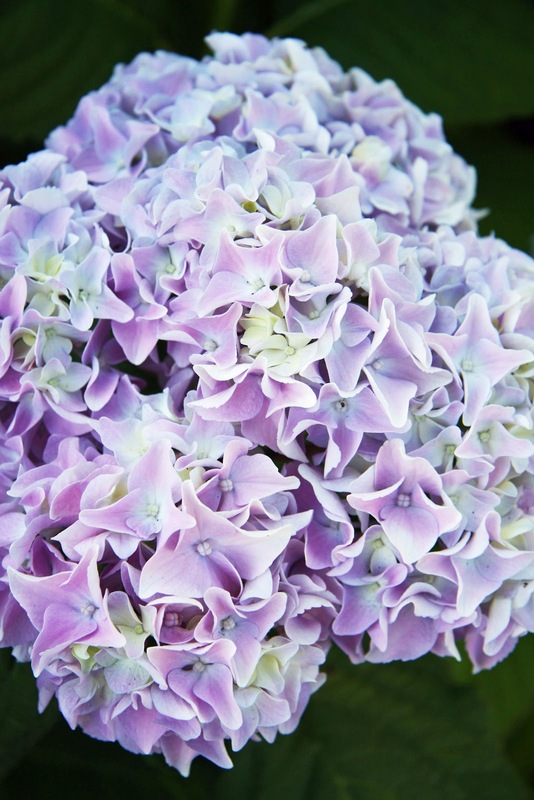 Hydrangeas have always been a favorite of mine, and yours are absolutely breathtaking! Breathtakingly beautiful! thank-you for sharing. Beautiful view...and I so glad to be vacationing in your corner of the world where I can enjoy all this beautiful area has to offer up close and personal. the last picture is breathtaking! 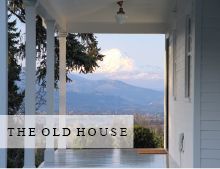 i'm so envious of the view from your porch! Such BEAUTIFUL flowers! And that view is to die for!! They look like very happy plants, and what an amazing view! Thanks for sharing it with us. 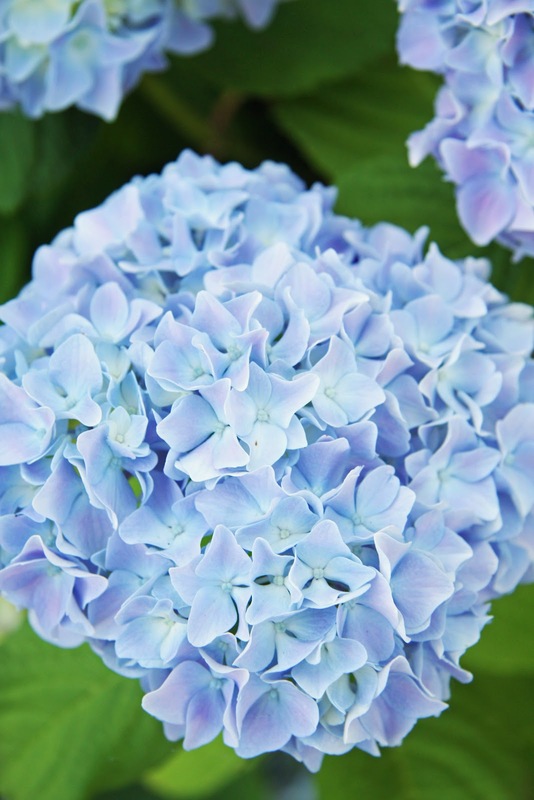 We have blue hydrangea around our ft porch! !!! That last shot of morning light is awesome! !! Have a great weekend!! I recognize that mountain inside your window frame. If I strain my eyes across the inland prairie-seas and heaps of hills that lie between us, I can almost see it...your photo supplies what my memory lacks. Such a lovely beginning to another hot, summer day. Thank you. Your hydrangeas are beautiful and I love their view! I've been admiring mine daily! Bea-u-t-full! I would like to know how many 1 gallon plants you planted in that area. For them to have grown so large is amazing. I have four little ones and they are growing but not by leaps and bounds...how many and how far apart? Thank you so much and yes, you view is supreme! Stunning hydrangeas....and the view is just to die for. Love you blog and your home so much. First of all..the view! Absolutely stunning. 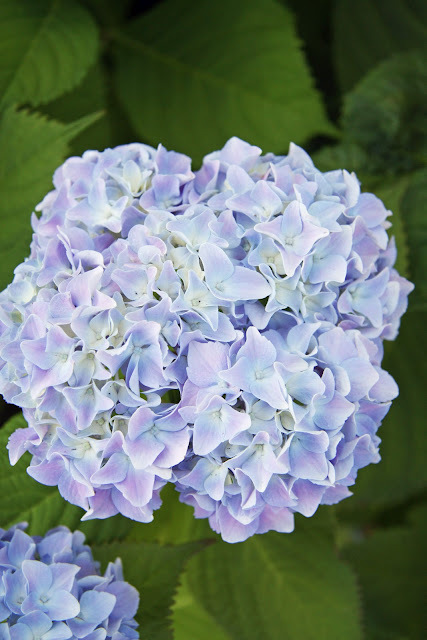 And I also love hydrangeas, nothing else says summer so much for me. I am happy with their blooms alone in the garden, well, the hydrangeas and the boxwood. That's all I need. Your view is stunning! I adore views of mountains! I have a question about your hydrangeas...are they in full sun? Our Endless Summers in full sun, south facing, 5 years in...look terrible! What direction? How much light? 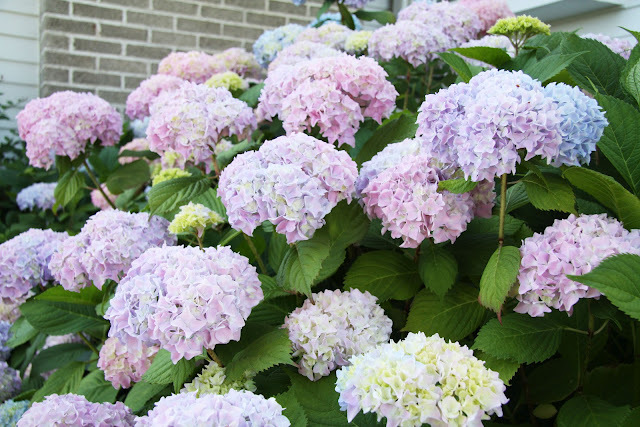 Your hydrangeas are just beautiful. what a gorgeous sight to see ~ it made me smile. OMGosh that view is magnificant! I love hydrangeas. I live in Florida on the Gulf Coast and they will not bloom here. Thank you for sharing your beautiful home and setting. Gorgeous! I cannot believe how large they have gotten in just three growing seasons. Around here our hydrangeas have scorched in the heat and the blossoms have faded, which makes your photos look even more beautiful. I love that the hydrangea head's can carry several shades and almost have a little rainbow of variation. Know wonder we all love this plant, it is so stunning. Amazing view off of your porch! 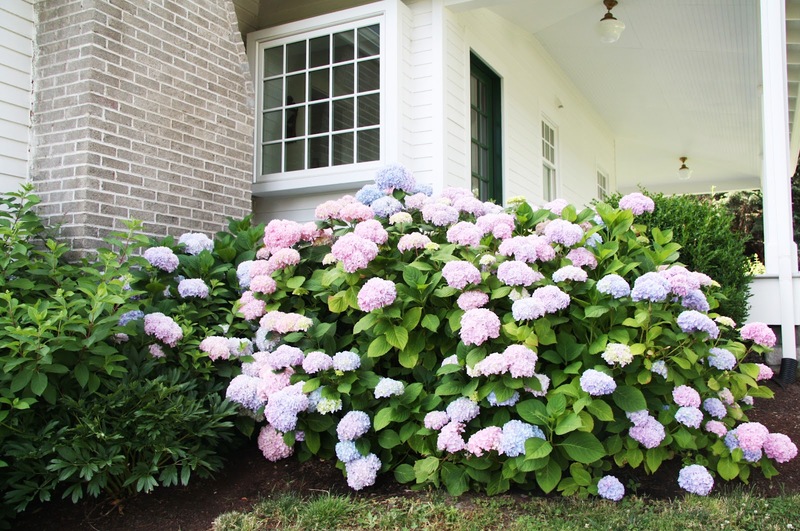 What a treat to see those beautiful hydrangeas! One of my most favorite flowers, in addition to peonies. I continue to dream of having a homestead like yours, Trina. I simply think your house and property is simply perfect. I am so happy that you share these tidbits with us! Oh so beautiful and the view is amazing!! As I have heard them say in Ireland, "gorgeous mop heads my dear!" That view. Oh that view....nearly made me gasp. Those hydrangeas are also equally gorgeous..oh lucky flowers to be so beautiful and to wake up and go to sleep to that majestic view! 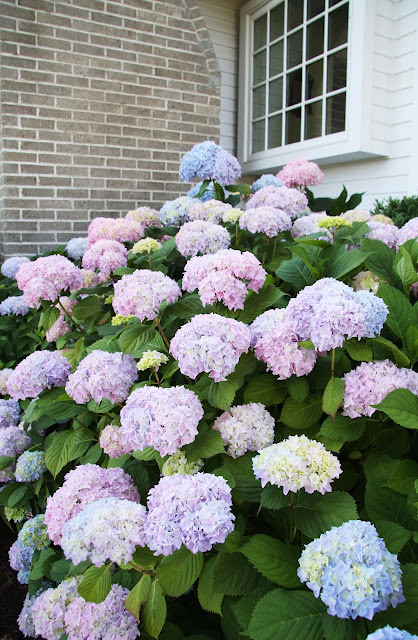 Your hydrangeas are gorgeous! Ours never look like that, but maybe it is the MS heat. This year we relocated them to the corners of our house. 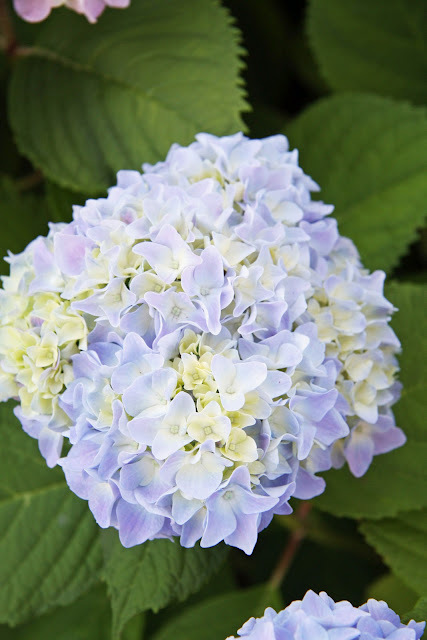 It seems that everyone with beautiful hydrangeas have them close to their home. Maybe in a few years ours will look like yours. Thanks for sharing! adore! so stunning abd only three seasons old! may I ask what orientation and sun light your beautifies get each day for such magnificent blooms ? My grandmother has been gone a few years now, but her favourites these were her favourites! Your pictures reminded me of her today, a wonderful gardener and beautiful spirit. Those are photos are very happy hydrangeas, Trina! Just beautiful! And that view from your porch is something so amazing, it leaves me breathless! May be a dumb question...but what mountain is that? Beautiful hydrangeas, and your view of the mountains is breathtaking! It is Mt. Adams in Washington state! The flower bed is on the northeast side of our house. It is a bit too sunny for them when we have really hot days but they seem to recover okay. They need lots of water during the heat waves. I planted three Endless Summer in front of the boxwood and three Nikko Blue along the house (along chimney and under window). They grew a lot this spring so perhaps they just need to establish their roots the first year or so. Me thinks I would like to be a hydrangea and live at your house with that view! Ohhh, that view!! What a gift. I just adore "following" you. I love your style--life style, too--and every time a post hits my inbox it's like a breath of fresh air. Thank you for sending such beautiful, pure captured moments to us all. Amazing view, plants and home! Do you feed your plants anything special? Mine never look that healthy. Now that's the view I dream of having from my home someday. 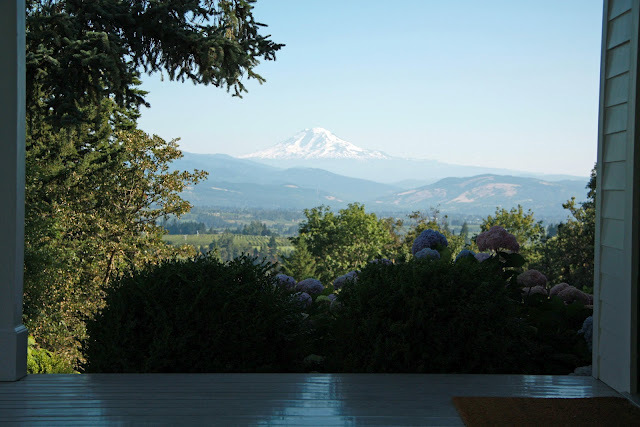 If I had to choose a view of the ocean or a view of the mountains, especially my favorite (Mt. Hood), it would be the mountains any day! What a lucky little bunny to be able to visit with you and your family. You have some very happy hydrangeas! Who can blame them? Absolutely stunning!! the view is out of this world too! I think you own a slice of heaven! I am so envious of your hydrangeas. All of the flowers really. 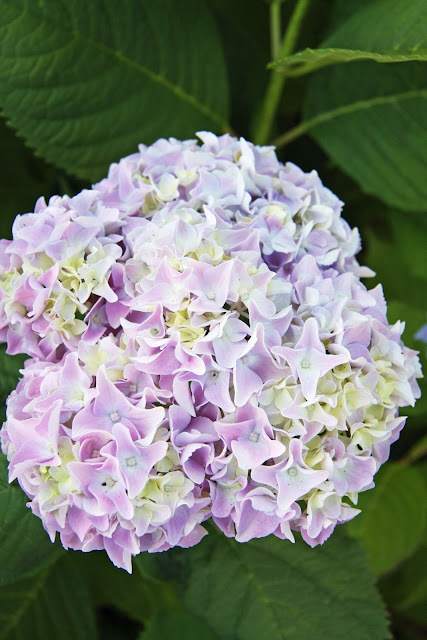 I have several Endless Summer hydrangeas that I planted this spring. I am looking forward to seeing them large and in full bloom in summer seasons to come. The early morning view is absolutely breathtaking!! You are blessed in so many ways. Thank you, Trina! That is very encouraging. The sunny end of my planter area, has new David Austin Roses. I've been told, the first year they sleep, the second year they creep and the third year they leap!!! Maybe the hydrangeas and the roses talk...between themselves! I love your hydrangeas. I have only the blue variety and though the pink starts out pink it becomes slightly washed out and then gets tinged with a sage green. Not ugly but notpink! these are gorgeous.